Will Self-Driving Cars Kill Colorado Jobs? As part of our research on the levers driving economic opportunity, we’re examining the effect of automation and artificial intelligence on jobs in Colorado. Some technologists and economists argue “robots” will take on the jobs done by real people today, while others, however, say automation will eliminate some jobs, change others, and create new work opportunities. Recently, Elon Musk, the head of Tesla, told a meeting of state governors that automation is around the corner in the form of self-driving cars. He said most new cars in the U.S. will be automated within 10 years. Twenty years from now, Musk continued, driving a car will be like having a horse – rare and optional. Self-driving, automated vehicles could be an important part of Colorado’s transportation infrastructure before we know it. In fact, we may not even need the 10 years Musk estimates: Last year, in a demonstration of its capabilities, an automated truck transported a load of beer from Fort Collins to Colorado Springs. 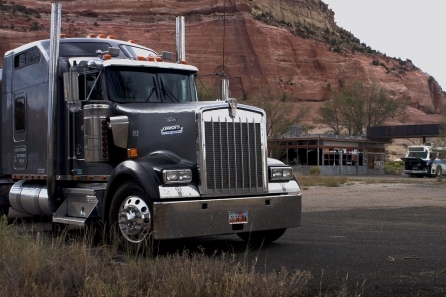 As more automated vehicles hit the road, what does this mean for those who drive for a living? Economists at the U.S. Department of Commerce recently issued a report identifying the jobs most likely to be affected by the introduction of automated vehicles. They examined the job requirements for a variety of occupations and divided them into two categories: “motor vehicle operators,” whose primary tasks involve driving, and “other on-the-job drivers,” who have other primary job functions, but driving is part of their duties. The economists determined that motor vehicle operators are more likely to be “displaced” by automated vehicles. Nationally, there are 3.8 million workers in the seven occupations that comprise this category, representing 2.8 percent of the total U.S. jobs in 2015. The economists identified 101 occupations that fall under the other on-the-job drivers category, totaling 11.7 million jobs nationally, or 8.5 percent of all jobs. They determined these workers more likely will “benefit from greater productivity and better working conditions” offered by autonomous vehicles. To see how self-driving vehicles might affect Colorado, we used Colorado Department of Labor and Employment data to identify the number of workers in motor vehicle operator occupations and the average wages paid for these roles. As the chart below shows, the largest number are heavy and tractor-trailer truck drivers totaling 27,772, or 1 percent of total jobs statewide, paying an average annual wage of $47,338. 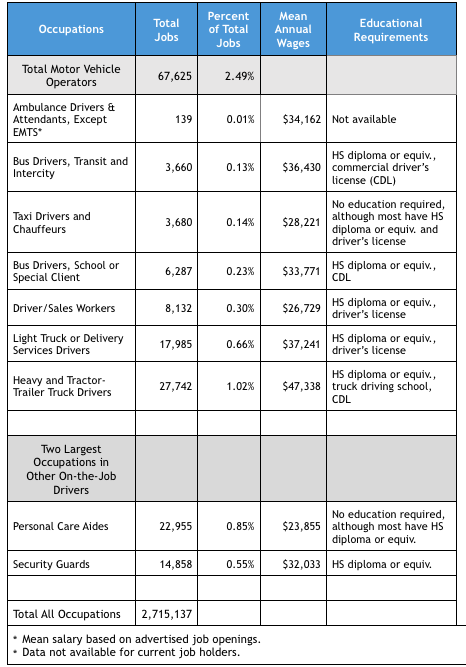 The two largest occupations in the other on-the-job drivers category are personal care aides (22,955 in Colorado) and security guards (14,858 in Colorado). As we continue to do research for our upcoming Opportunity Report, we’ll take a closer look at how automation will affect other jobs in Colorado.